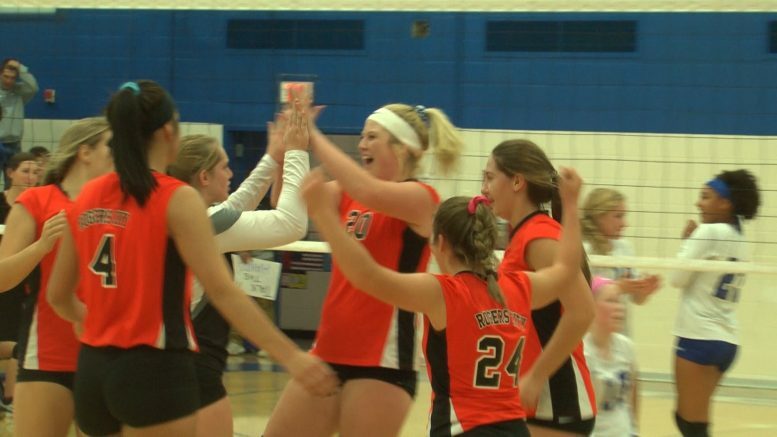 OSCODA — The Rogers City Hurons battled the Oscoda Owls in a top North Star League volleyball match-up Tuesday evening. It was a fight at the net between Hurons’ senior Taylor Fleming and Owls’ junior Lauren Langley. This game was a defensive fight between the two powerhouses at the net and in the back row. In the end, Rogers City topped Oscoda 25-19, 25-17 and 25-19 in three sets. Fleming contributed seven kills and five blocks and Maddie Hincka hit five kills. The Hurons overall record is (16-13-3).